Home » Carpenter Bus Blog » Do You REALLY Need a 20 Passenger Bus? Find Out NOW! Every part of society, including families, communities, and businesses, benefits from using public transportation. There are times when certain groups or organizations, such as a church or senior care facility, require more transportation than is offered by mini vans or other passenger vans. A 20 passenger bus is generally built on the same chassis as 15 passenger vans, but is extended a few extra feet, giving the customer more options. The customer can either have 20 passengers with dedicated rear storage, or the bus seats can be spread out more offering more leg room. College and university sports teams tend to prefer the latter option. The 20 passenger bus offers comfortable seating for larger groups, and is convenient for those looking for increased passenger capacity. Flexible and comfortable seating arrangements, as well as the enhanced capacity, allows passengers to feel safer and more relaxed. Using a bus, instead of driving also gives you time to do other things that you enjoy. In addition, using a 20 passenger bus saves fuel, reduces congestion, and saves money. One liability that comes with purchasing a 20 passenger bus is having to obtain and maintain a CDL (Commercial Driver’s License). Federal Law requires anyone driving a vehicle carrying 16 or more passengers (including the driver) to have a CDL with a passenger endorsement. However, there are some states that have laws that are more stringent than federal laws and require a CDL on a lesser amount of passengers. Please check with your local or state DMV to see what laws affect you pertaining to driving higher capacity vehicles and the Commercial Driver’s License requirements.The cost to upgrade from a 15 passenger bus to a 20 passenger bus is negligible. 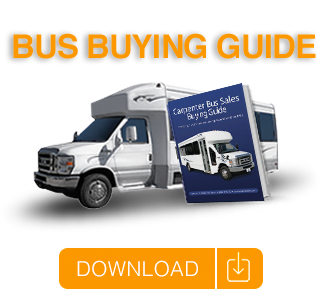 If you can solve the issue of having enough CDL drivers, then going with a 20 passenger bus might be the very best option for you.